Tag Archive | "JV Baseball"
After a few game cancellations before spring break, the Cedar Springs JV baseball team finally took the field for four games during the week of April 8. 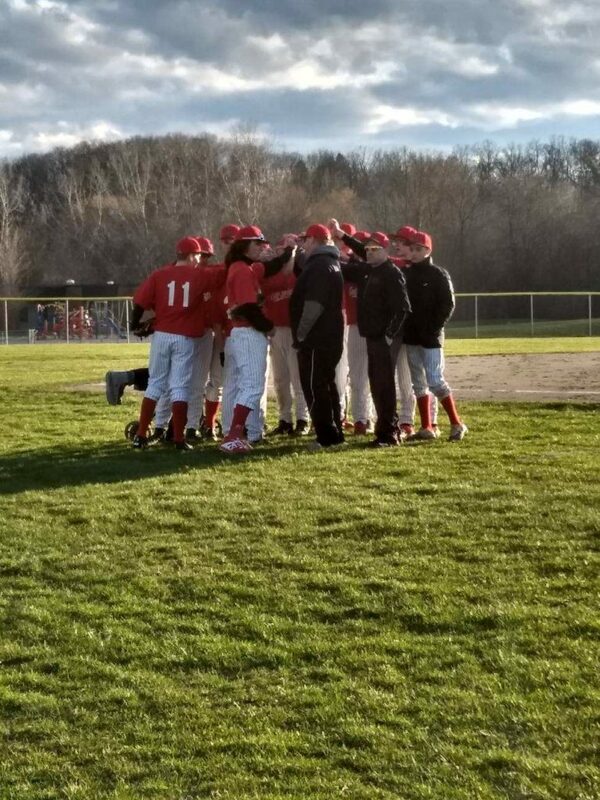 JV Baseball team gets together after picking up win Friday night at Lowell. Courtesy photo. They opened the season Monday, April 9, with an 11-3 non-conference win against Grant. New coaches Matthew Greenland and Kevin McDonald were happy with the play of the young men for the first game of the year. The coaching staff decided on a pitching by committee for the game. Dylan Knauf, Aiden Brunin, William Zain, Gage Haywood and Logan Petty all pitched in the game. William Zain let the team with 2 hits in the contest, Logan Petty, Jeremy Campione, Dylan Knauf, Gage Haywood, Alec McDonald and Issac Rypma each having a hit. OK White Conference play opened immediately after with a home double-header contest with Lowell on April 10. During the first game, Dylan Knauf pitched well but the Red Hawks could not get bats going against a good Lowell team and lost the first game 6-2. Trenton Snoeyink started Game 2 of the double header against Lowell and he pitched 5 strong innings. At the end of 5 innings, the game was called due to darkness and was tied 2-2 in the top of the 6th inning. The team then traveled to Lowell on Friday, April 12, to Lowell to complete the season series and complete game 2. Logan Petty got the pitching going for the continuation game and pitched great. The game was still deadlocked 2-2 after 7 innings. The Red Hawks then had a bad half inning allowing 4 runs in the top of the 8th inning, and lost game 2 of the series 6-2. The third and final game of the series was well played on both sides with mistake-free baseball. The Red Hawks were down 2-1 thru 4 innings. In the top of the 5th, Issac Rypma had a great at bat and drew a walk. Gage Haywood then pinch ran for Rypma, and that’s when Coach Greenland went to small ball. Great bunts by McDonald and Snoeyink led to bases loaded. Campione drew another timely walk making the score 2-2. Zain then hit a sacrifice fly to bring in Snoeyink to take the lead 3-2. The Red Hawks picked up an insurance run in the 7th and picked up the win in the game 4-2. Freshmen Aiden Brunin pitched a complete game, a 2-hitter. There was great overall defense by the team including a great diving foul ball catch by Anthony Lizardo. In the series, Campione led the team with 3 hits; Zain, Snoeyink, Rypma, and Brunin had 2 hits each; and Mcdonald had 1 hit. Before the season started, the team lost Dylan Greenland for the season and Gage Haywood is battling some early arm soreness. “Like any team with injuries, we’re going with the next man up mentality,” he said. The Cedar Springs Red Hawks JV baseball team played a three game set against Northview last week. Games 1 and 2 were played Monday, May 7. Game 1 went nine innings with Northview coming out on top 9-8. Connor Ellison and Trenton Snoeyink pitched a great game but, again, errors cost the Red Hawks the game. At the plate, Gage Haywood, Dylan Greenland, and Willy Zain each had two hits. Snoeyink, Ellison and Dylan Knauf each had a hit as well. The boys had several chances to win the game, leaving 10 runners on base throughout the game. In game 2, errors cost them again as Colton Moore took the mound. Five errors led to big innings by Northview as they defeated the Red Hawks again 10-2. Connor Ellison continued hitting the ball well with two hard hits. Jeremy Campione chipped in with two hits as well. Trenton Snoeyink and Dylan Knauf each had a hit. Game 3 was played on Wednesday, May 9. Kyle Wise, Willy Zain and Jeremy Campione shared time on the mound. The Wildcats of Northview hit the ball well, scoring 18 runs. The Red Hawks managed 8 runs on 8 hits, led by Connor Ellison with two. Snoeyink, Campione, Secord, Greenland, Knauf and Dykhouse each had hits as well. It was a long week of fighting illness and injuries, leaving the JV team with an 11-10-1 record. Next is a non-conference week against West Ottawa and Big Rapids. 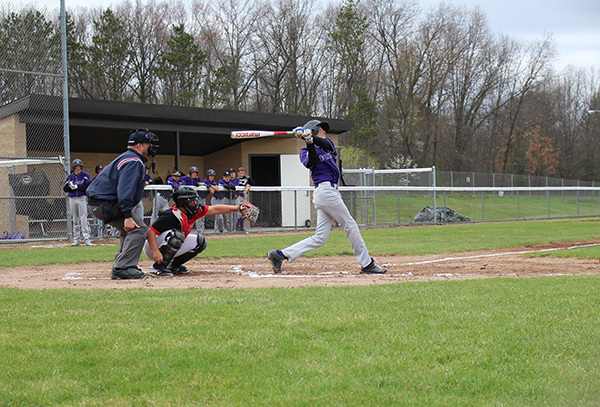 The JV baseball team played a three game series against Ottawa Hills last week. The Red Hawks won all three games, scoring 50 runs in the series. Jerome Patin and Willy Zain each had four hits in the series. Gage Haywood, Trenton Snoeyink, and Colton Moore each had three hits, while Connor Ellison, Dylan Knauf, Clyde Dykhouse and Kyle Wise each had two. Dylan Greenland, Caden Vandenberg, Lucas Secord and Jeremy Campione also had hits. Kyle Wise, Colton Moore, and Dylan Greenland each earned victories on the mound, not allowing a single run. 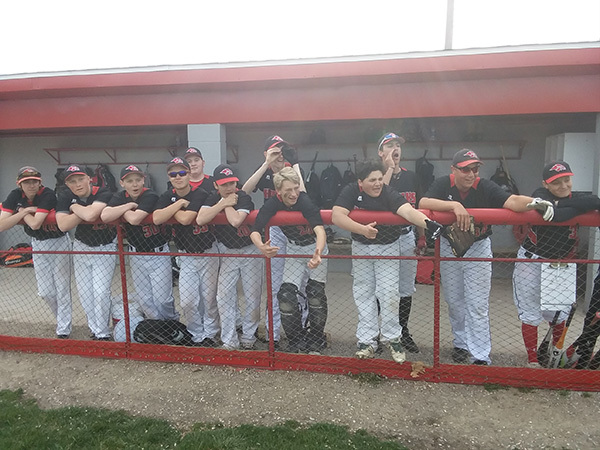 On Thursday, April 26, the JV team made the trip to Fremont. In the opener, Dylan Knauf threw a two hit shutout, striking out 10 and walking only one in a thrilling 2-0 victory. Trenton Snoyink and Jeremy Campione had 2 hits each and each scored runs in the final inning to get the win. In the second game of the double header, Kyle Wise earned the victory on the mound, striking out four and walking one. The Red Hawks were more efficient at the plate. Trenton Snoyink continued driving the ball, landing two hits, while Campione, Knauf, Zain, Ellison and Greenland each added a hit in the 11-0 victory. It was a great week for pitching and defense. In 5 games the boys committed only 3 errors and pitchers didn’t allow a single run. The JV team is currently 9-4-1 on the season. Dylan Knauf got the win against the Red Arrows in game one of a doubleheader last week. 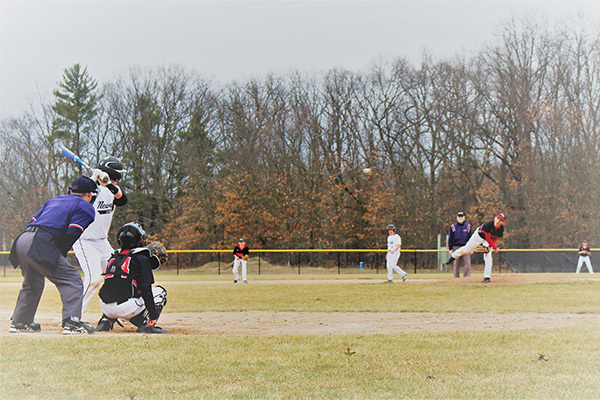 The JV baseball team was able to get two games in on April 11 before Mother Nature decided to play a joke on us with another touch of snow and ice over the weekend. 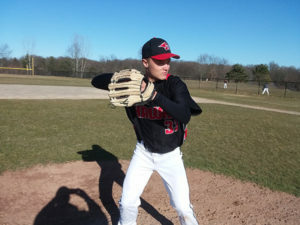 On Wednesday April 11, the Red Hawks played a double header against the undefeated Huskies of Forest Hills Northern. In the first game, Connor Ellison pitched a great game, striking out 3 and walking none. He allowed 6 hits over his six-inning outing. His defense didn’t help him much, committing 7 total errors. In the 10-3 loss, only 2 of the Forest Hills runs were earned. At the plate, Trenton Snoeyink, Dylan Knauf, Lucas Secord, Jeremy Campione and Caden Vandenberg all recorded a hit. As a whole, the Red Hawks left a dozen runners on base and weren’t able to get hits when they needed them. In the second game, Kyle Wise struggled throwing strikes, walking 7 and hitting one batter, while allowing 6 runs. Colton Moore was able to hold the Huskies to just one run in his two innings of relief. 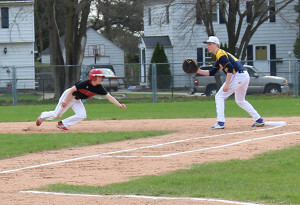 Offensively, the Red Hawks were able to draw several walks, which were brought around to score with hits from Connor Ellison, Lucas Secord and a big double from Caden Vandenberg. With aggressive baserunning and these timely hits the score was tied at 7-7 when the sun went down and the game was called due to darkness. Last week the JV baseball team played a three-day set against the Red Arrows of Lowell. On April 19, they played a doubleheader. In game one, the Red Hawks were led on the mound by Dylan Knauf. In six innings of work, he allowed 4 runs on just three hits, while walking one. Trenton Snoeyink pitched the seventh inning to earn his second save of the season in the 7-4 victory. At the plate, Jeremy Campione had a pair of hits. Dylan Greenland, Willy Zain, Trenton Snoeyink, Caden Vandenberg, Dylan Knauf and Gage Haywood each had a hit as well. In game two, Sophomore Colton Moore struggled throwing strikes on the mound, and allowed 8 runs, though only 3 of them were earned. The defense also committed several errors that sunk a few innings. Dylan Knauf had two doulbles batting in the leadoff spot. Willy Zain had a pair of hits as well, one of them a double. Lucas Secord hit a double as well. Trenton Snoeyink and Clyde Dykhouse each added a hit. The game 2 final was 12-5. In game three, on April 20, our boys ran into a tough pitcher from Lowell and were only able to scrape together one hit each from Willy Zain and Jeremy Campione. Defensively they committed six errors as a team in the 10-0 loss. The JV team is 4-4-1 overall. This week they are scheduled to play a trio of games against Ottawa Hills and a double header against Fremont. Logan Kobayashi had a good week calling games behind the plate for the JV Red Hawks. Here he is shown in one of the games against Greenville. Last week was a good week for the JV Red Hawks baseball team. They went 2-2 for the week and won the conference series against Greenville. They were only a couple of plays away from being 4-0. The week ended with a 4-2 loss against Grant. Tuesday’s games against Greenville were wins, 11-3 and 9-4. Thursday, April 20, they lost to Greenville 5-4. Logan Kobayashi had a good week calling games behind the plate and showed great base running instincts. This week’s games will be against Grand Rapids Ottawa Hills.